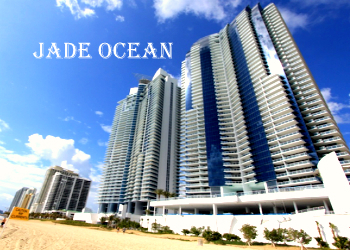 Why Should You Buy a Unit in Jade Ocean Sunny Isles? Most people enjoy the sunny weather and the beach. Living in luxury, oceanfront condominium is even better. Combine it with such amenities like private beach, beach services, including a lounge chair, towels, restaurant, pool, gym, spa and top services from the staff will offer a lifestyle everyone dreams about. Sunny Isles Beach in South Florida is one of those places which is a popular tourist destination and also offers one of the best family-oriented, residential real estate. It is so popular because all condos are located directly on the sand along the coast of Atlantic ocean. It is considered one of the top places in US for comfort, convenience and lifestyle. The gorgeous Sunny Isles Beach offers wide variety of luxury condominiums, which are architectural marvels as well as technologically advanced structures. One of the most beautiful condominium is Jade Ocean. This condominium is located directly on the ocean, amidst a serene and blissful ambiance. Jade Ocean Sunny Isles offers many extraordinary amenities and services to the residents, making their stay in this luxury condominium, the most amazing experience of their life. The eminent architect and designer, Carlos Ott has developed the splendid, aesthetic design of this building. This magnificent edifice is like a shining jewel in the attractive Sunny Isles Beach. This splendid edifice is 51-story high and the total number of units in this condominium is 256. The units are very beautiful and elegantly designed, and are available in different sizes and prices, giving an opportunity to the buyers to choose units as per their requirement and budget. Jade Ocean Miami is one of the finest properties in the entire Sunny Isles area. The building features some of the most astounding residential features and provides advanced amenities and facilities for an ultra-modern lifestyle. 3. The kitchens are designed with glass kitchen cabinets, granite countertops, Sub-Zero kitchen appliances, etc. 4. The bathrooms are decorated with quality faucets and fixtures designed by European designers, luxury bathtubs, etc. If you want to buy a unit in Jade Ocean, you may want contact a local real estate company – One Sotheby’s International Realty, at (305)332-3574. This reputable real estate company is located directly across the street from Jade Ocean and have expert agents who will provide excellent service and have great knowledge of this condominium and the units in Jade Ocean for sale. You may also visit the website of this real estate company to get more details regarding this condominium.